Pokémon Go was released last week, and it seems to have taken over the world. And not just the world, but people’s houses, bathrooms, and even the Westboro Baptist Church. Pokeman Go is an augmented reality app, in which Pokémons are inserted (or superimposed) into real world context on your phone, using both the GPS and the clock. 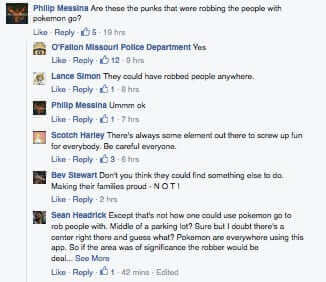 But already bad guys are using it to rob people, and one poor woman unwittingly found a dead body along with her Pokémons. The point of Pokémon Go, at it’s base, is to collect Pokémon, which you do by finding them… in the real world. You capture them by throwing a Pokéball at them. 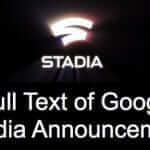 (You can also turn off the augmented reality, and have a computer generated background.) Of course there’s more to it, and in-app purchases, but this is the basic description and, of course, why it’s taking the world by storm. 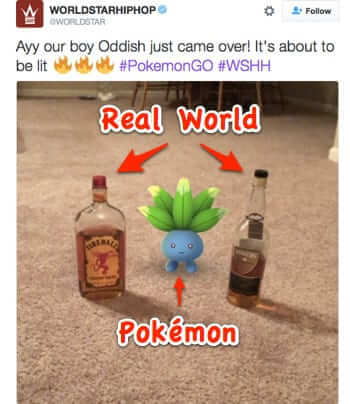 Because… Pokémon… in the real world. And, all sorts of locations may yield Pokémons. 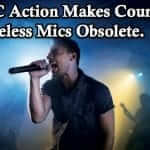 Typically these are public locations, including churches. 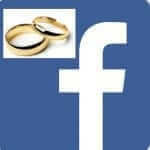 This has led to all sorts of interesting situations. For example, Boone Sheridan and his family live in an old converted church in Massachusetts. Did you catch that? They live in what may at one time have been a public building (a church), but is now their home. 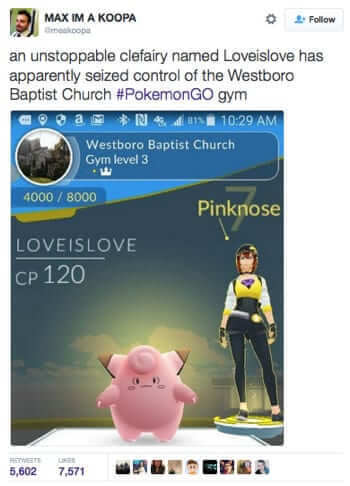 And, someone with a sense of humour made the Westboro Baptist Church into a Pokémon gym. 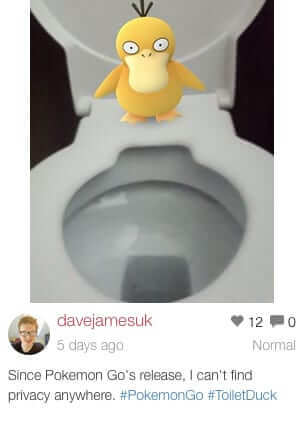 And, apparently, Pokémon Go characters also need to use the toilet. But already, Pokémon Go has led to some dark places. Some by design, some quite by accident. Shayla Wiggins, for example, found a dead body while looking for a water Pokémon while playing Pokémon Go. She didn’t notice the corpse, laying face down in the water, until she was just six feet from it. But by far the most sinister situation resulting from playing Pokémon Go, at least to date, is the armed robbers using the game to lure unsuspecting victims to a secluded location, in order to rob them. 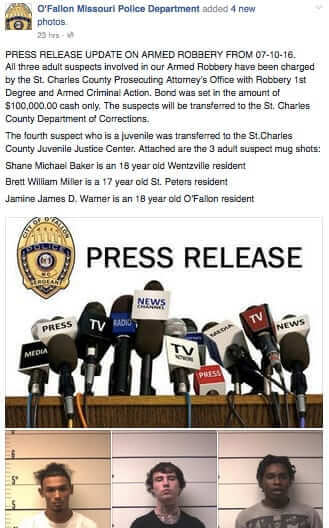 O’Fallon PD took Shane Michael Baker, Brett William Miller, Jamine James D. Warner, and a fourth juvenile suspect into custody. 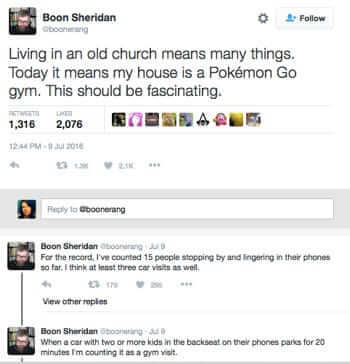 This occurred yesterday (July 10th, 2016), and remember that Pokémon Go was just released four days earlier (July 6th, 2016). Eh… Churches are not public places. 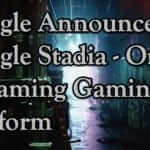 Has Niantic no scruples whatsoever?